The City of Växjö is situated in the southern part of Sweden, surrounded by forests and lakes. As many parts of the central City of Växjö were built upon wet and swampy areas they are vulnerable to floods after heavy rainfall events. One of the most affected parts is the street Linnégatan which is built on a previously existing small stream and which is situated much lower than the surrounding built areas. In past years, rainwater often flooded the street and the nearby buildings’ basements and cellars. At the end of the 1990’s, the City of Växjö started to reopen the canal in Linnégatan, i.e. 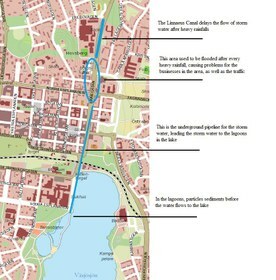 the Linnaeus canal, in order to prevent the streets and surrounding areas from flooding and to regulate the flow of the storm water to the Växjö lake. The canal is an example on how adaptation to extreme weather events and environmental targets, i.e. the water quality of the Växjö Lake, can be combined in one system of integrated measures. Annual floods were present and strongly affected the local infrastructure close to Linnégatan in the past. Streets were flooded for several days and nearby buildings ‘cellars were filled with storm water causing high cleaning and reconstruction costs. About 15 years ago, there was very little discussion about local climate change and its impacts; the guideline was to develop effective measures to be prepared for 10-year rainfalls – not in the context of climate change but in the context of highly recurrent heavy rainfall events. Dealing with 10-year rainfalls means that instead of expecting floods after every heavy rainfall event, floods are expected only once every 10 years. The major challenge was to define what a 10-year rainfall means and what can be expected, e.g. the total amount of rainfall per square meter and per a specific time-frame. About 15 years ago, a 10-year rainfall was 218 litres per second and hectare. Current projections assume about 250 litres per second and hectares what means an increase of 15 percent in 15 years. Thanks to the Linnaeus canal, the city of Växjö has avoided many floods during these 15 years and will be secured from most of the floods in the following years, also considering, at least in part, future climate change effects. Since the canal was built, there has only been one severe flood in August 2014. This measure as other storm water management investments that has taken place in the recent years, was addressing current impacts of climate variability. However, the knowledge gained can be used to manage storm water and reduce the risks of floods even in the future, considering, at least in part, the effects of climate change. Since the city of Växjö has developed a climate adaptation strategy, more precise data are available and will help to develop future actions for climate change adaptation. Projections assume an increase in heavy rainfall events and thus more storm water due to climate change. The challenge for planners, technicians and others working at the municipality will be to necessarily increase the capacity of existing structures such as the Linnaeus Canal. The existing urban structure with buildings, streets and green space limits the facility to extend the Linnaeus Canal, for instance. Therefore, new measures have to be carried out in other locations in the city. In the past, there was a small-above ground stream at the location where the street Linnégatan runs today. The stream served as drainage and leads storm water to the inner city Växjö Lake. The stream was overbuild and canalized in the course of the street construction in the following years. This new below ground canal was not capable to store storm water after heavy rainfalls anymore, causing flooding of the neighbouring areas. Moreover, the water drained off to the Växjö lake taking residues, mineral oil and other waste to the lake. At the end of the 1990’s, the City of Växjö started to reopen the canal in Linnégatan, i.e. the Linnaeus canal, in order to prevent the streets and surrounding areas from being flooded and to regulate the flow of the storm water to the lake. The Linnaeus canal functions as a 220 m long storm water storage tank where the storm water is collected and discharged to the Växjö Lake via a below ground pipeline. Almost all storm water from the central parts of Växjö finally ends up in the lake, potentially increasing its levels of nutrients, particles and heavy metals. In order to prevent this, the water from the Linnaeus canal is discharged into the sedimentation lagoons located nearby the lake. After passing the lagoons, the water is discharged into the lake. While the Linnaeus Canal and other types of systems for storage, delay and drainage of storm water have been realized in Växjö, it has also been important for Växjö to reduce the environmental impact on the central Växjö Lake. The realised measures aim to combine solutions to both hydraulic and environmental targets. At first it was planned to build the lagoons as dams in City Park next to the Växjö Lake. After the plans were published and made available to all interested parties, protest raised from citizens and environmental NGOs to change the original plan. Indeed, after roundtable discussions with these stakeholders, including the municipality as well, they came up with the solution to build lagoons in the lake. It turned out to be a better solution since the park could be untouched. The project became successful due to the synergies of various functions (storm water management and storage and control of pollutants) and other indirect benefits (such as those related to traffic safety and urban landscape issues). It was shown that it is possible to implement climate adaptation measures in a good design where it blends into the city landscape. The whole investment cost nearly 2,000,000 €, of which about 15 % was funded by the Swedish Government via the Swedish Local Investment Program for Sustainable Development. The remaining part was funded by the Technical Department of the City of Växjö. Thanks to the investment, this part of the city is now mostly protected from floods after heavy rainfalls. The canal is dimensioned to manage the worst rainfalls estimated to occur only once every ten years. Since the construction of the canal, there have been a few floods, but not as often as before. So, this kind of storm water storage and delay system has proven to be efficient. Due to the expected future amount of rainfall there is a need for further improving measures to prevent flooding in Växjö. Experiences gained within this project will help to develop improved solutions and will provide a valuable example for other municipalities around Europe. One direct co-benefit of the canal has been that it has contributed to increased traffic safety in the street. 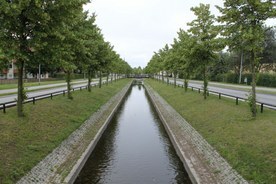 The Linnaeus Canal is situated in the middle of the street, outside a secondary school. Before, there was a bigger risk for accidents between cars and people crossing the four lane street. Now, there are only two lanes and people have the possibility to wait on bridges over the canal before moving on to cross the other driving lane. Another environmental benefit is that the canal and the connected sedimentation lagoons, contribute to reduce the flow of storm water to the lake, and have also a positive effect on the water quality by reducing the amount of pollutants ending up in the lake. The Canal is not only an important part of Växjö’s storm water management. The open water body is a beautiful element within the city and also refers to the historic Växjö where a stream was originally situated in this area. 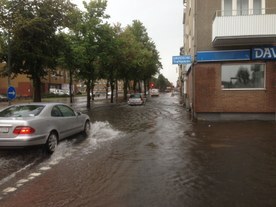 According to the Swedish Environmental Code, storm water in planned areas shall be considered as waste water. Therefore, storm water is handled by the Environmental Code, which declares what amounts of pollutants are acceptable / non-acceptable. The organization Swedish Water (Svenskt Vatten) has recommendations on dimensions of disposal of storm water. These guidelines will be more ambitious from year 2015/2016 and will clearly describe “storm water systems” instead just of storm water pipeline dimensions that are mentioned in the current guidelines. Another guideline from Swedish Water (Svenskt Vatten) deals with sustainable storm water management and gives advice for design and solutions in various situations. The praxis or recommendation for storm water management systems in Sweden is that they should have the capacity to handle 10-year rainfalls, under current conditions. This might change with climate change, and could require improved measures to deal with storm water management. Both guidelines are not legally binding, but if something would happen, the municipality can absolutely be determined as responsible if the recommendations from Swedish Water were not met. The Linnaeus Canal is one example on how these recommendations can be fulfilled by a municipality. The project started in 1998 and ended in 2001 when the Linnaeus Canal and the sedimentation lagoons were finalized. Lifetime of the canal is probably around 100 year. It needs regular dredging of sediments to function properly. The current water capacity of the canal works well under the current rainfall conditions but has to be improved with climate change.